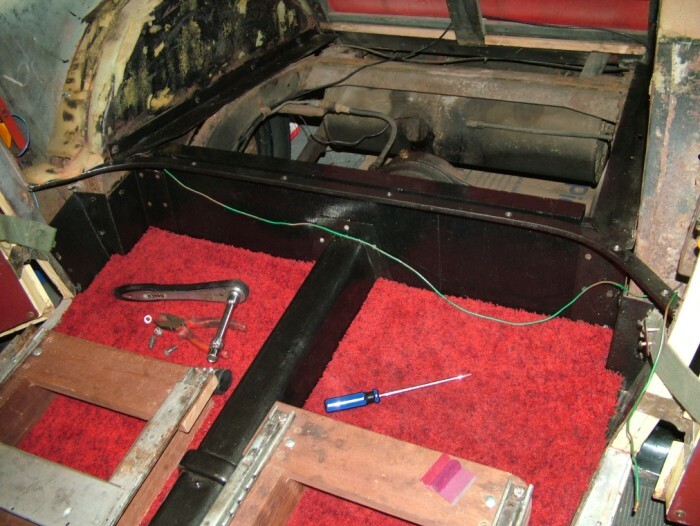 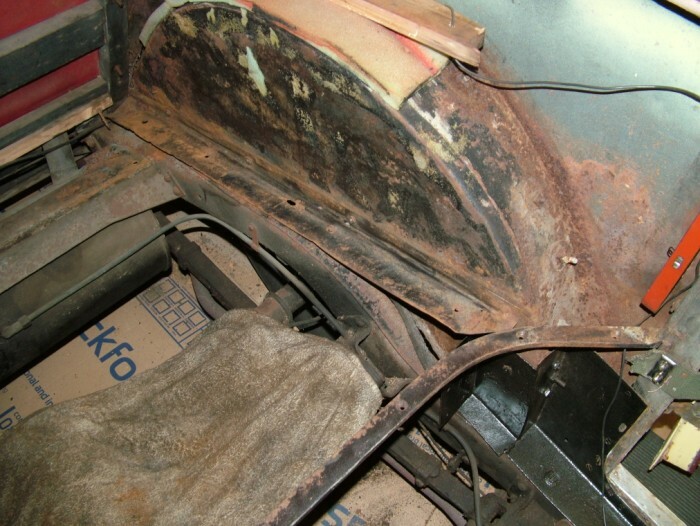 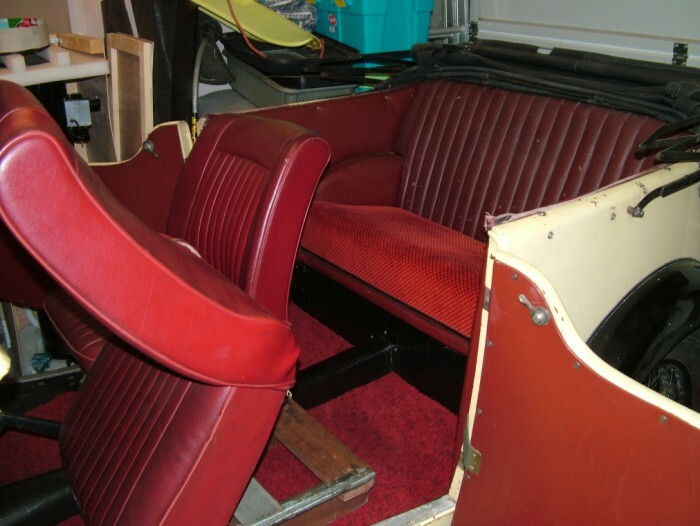 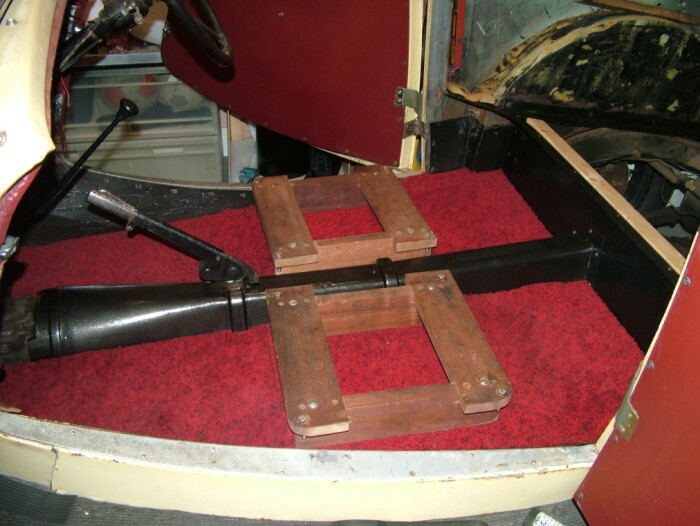 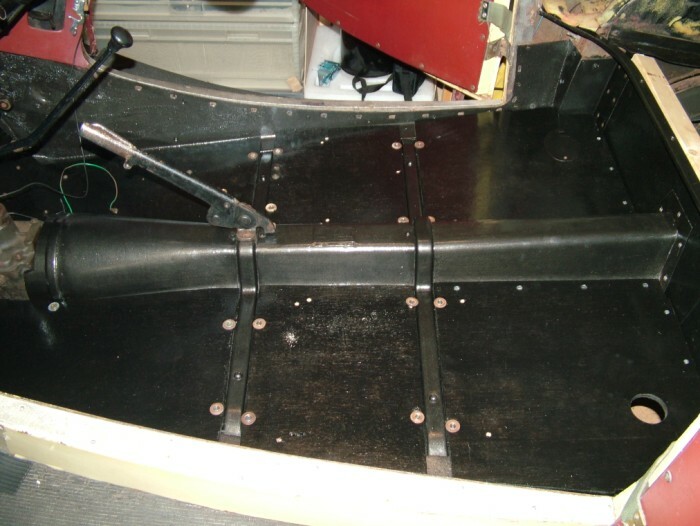 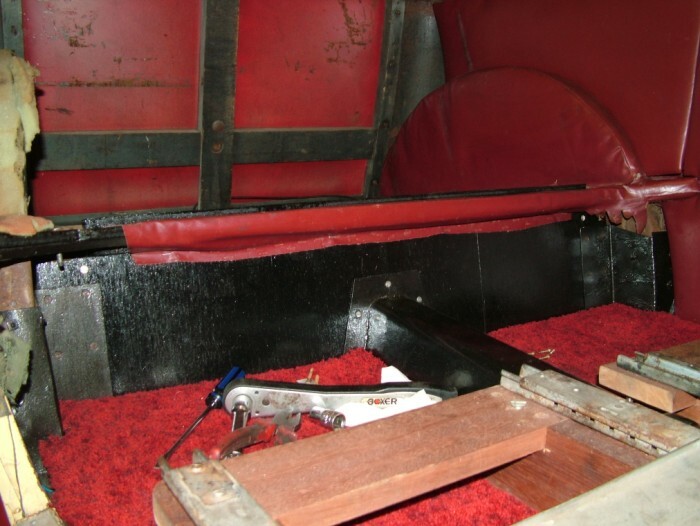 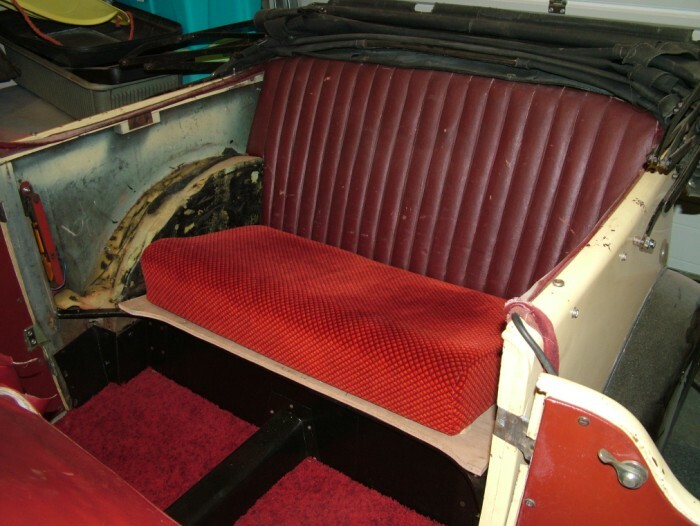 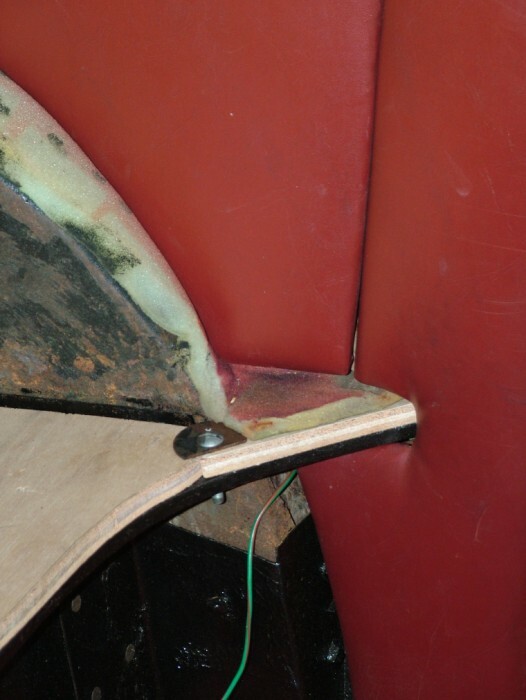 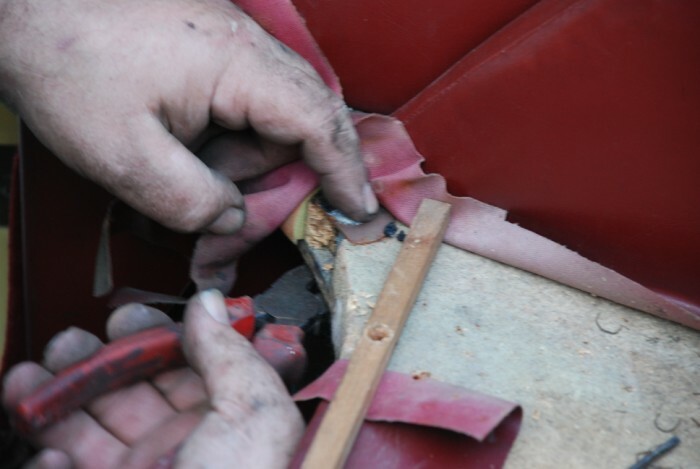 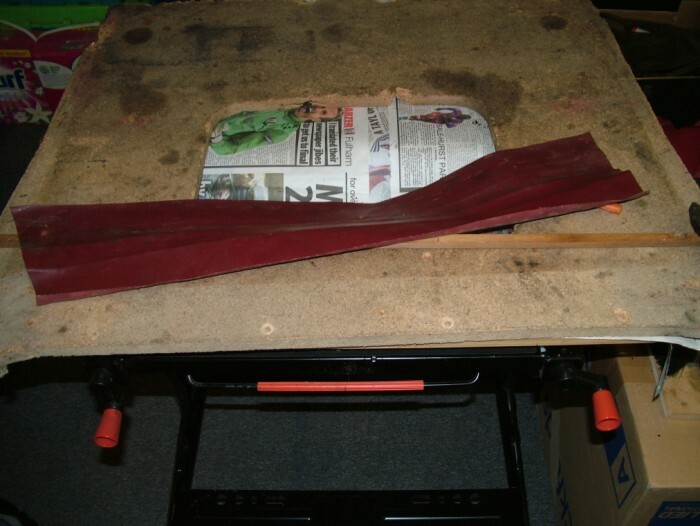 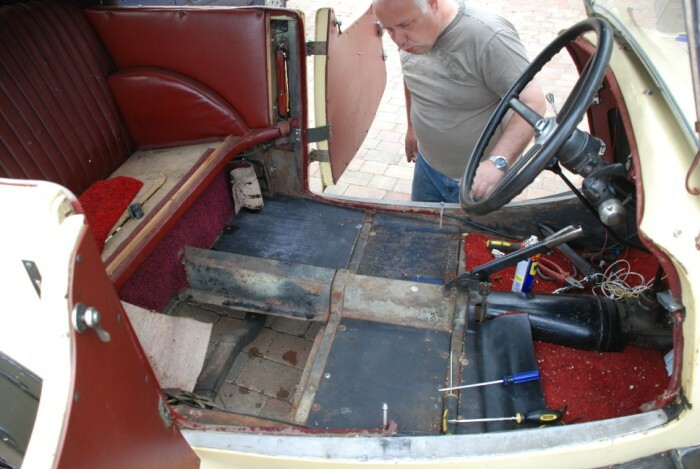 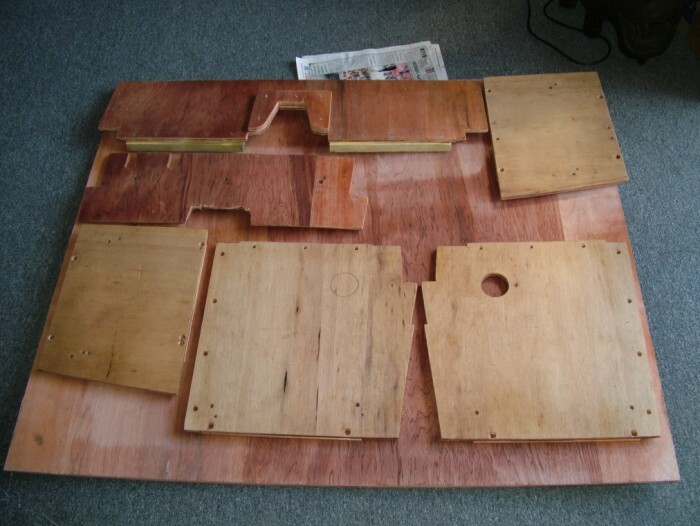 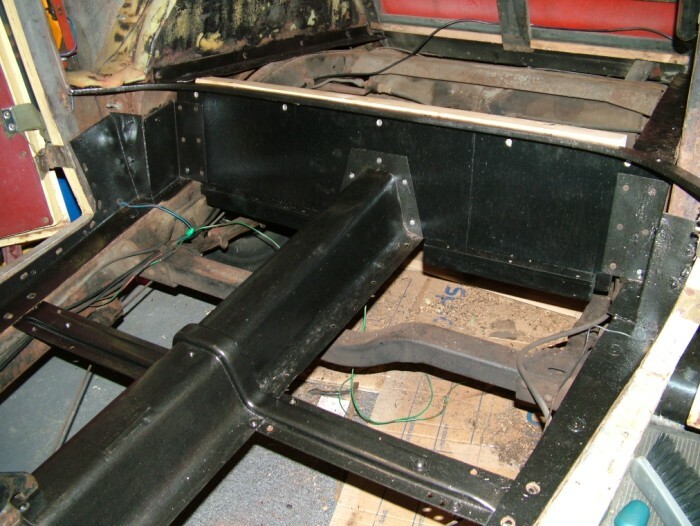 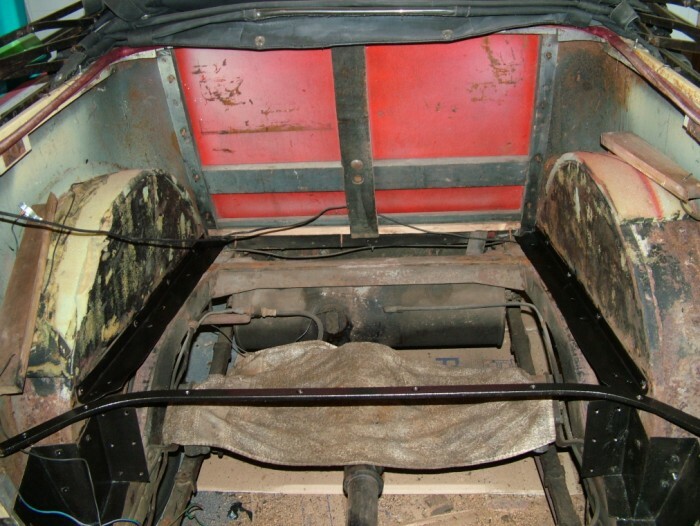 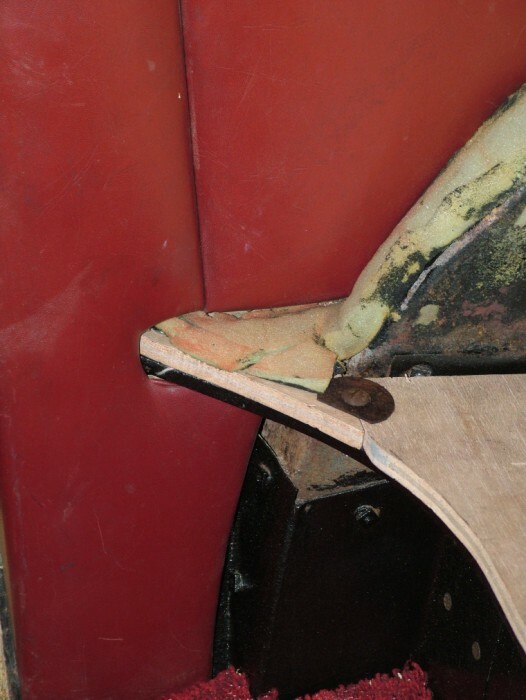 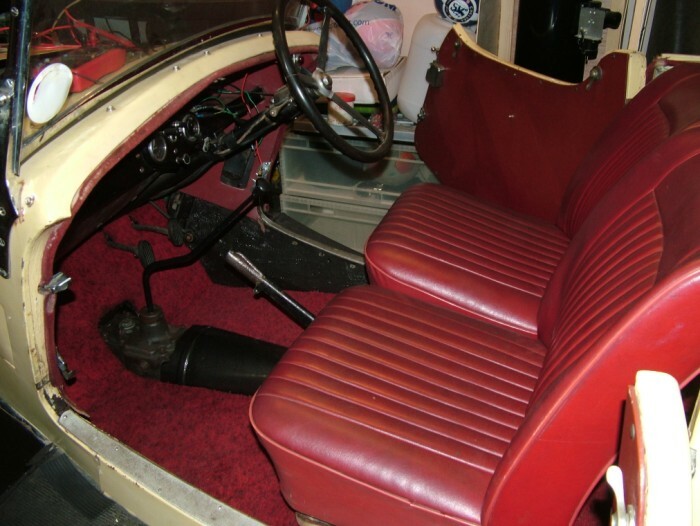 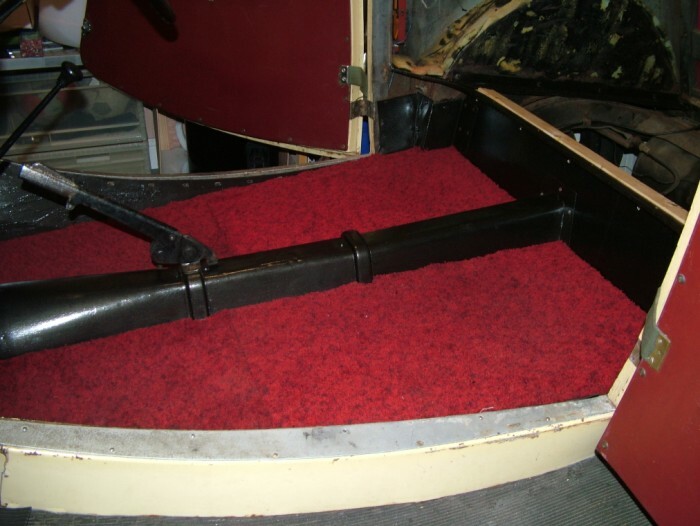 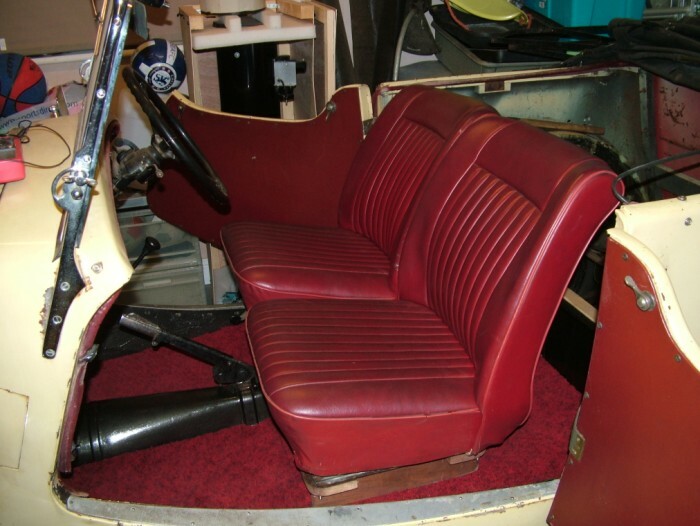 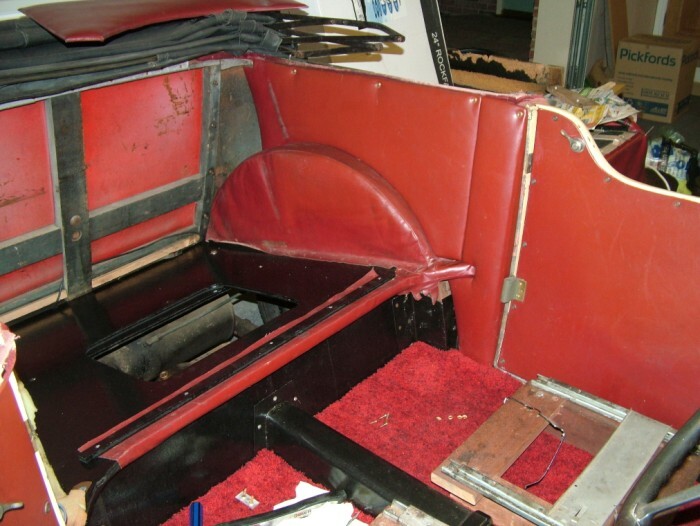 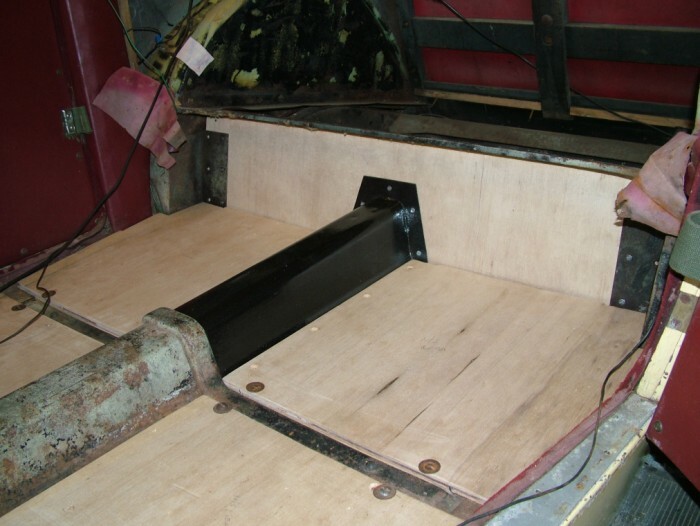 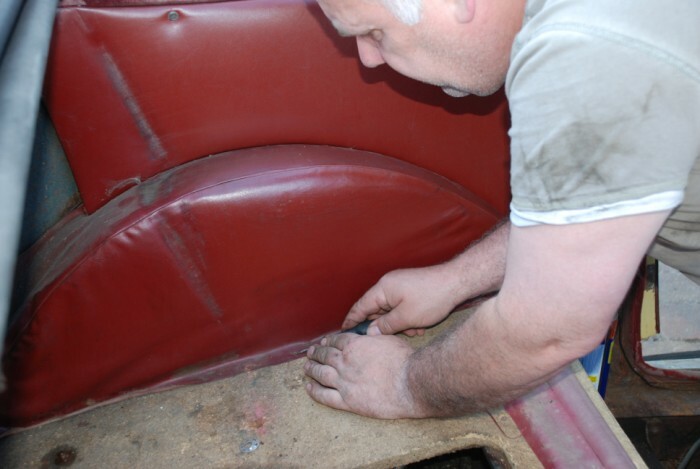 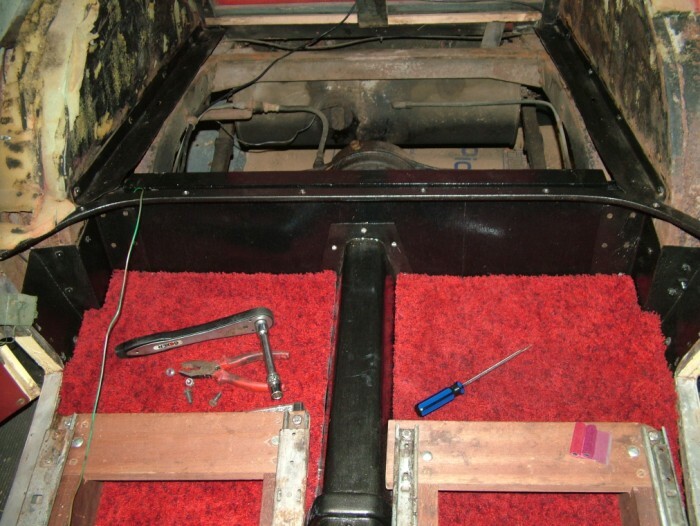 The following pictures show the work that was undertaken to replace the Morris Eight floorboards and rear seat woodwork. 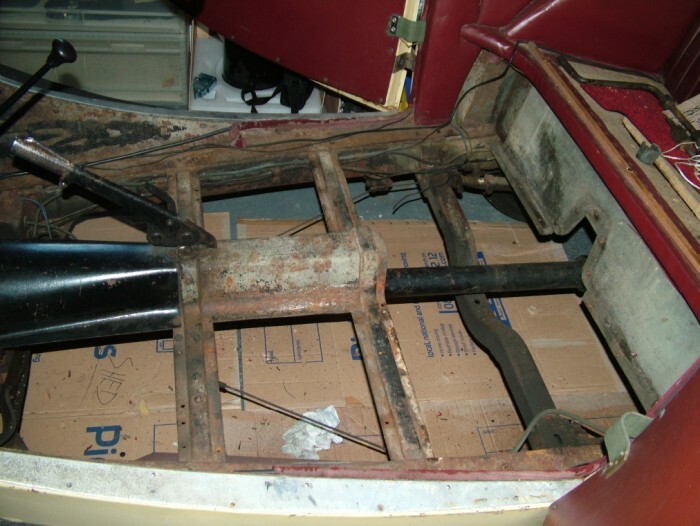 After removing only one piece of floorboard, I wondered what I had taken on!!! 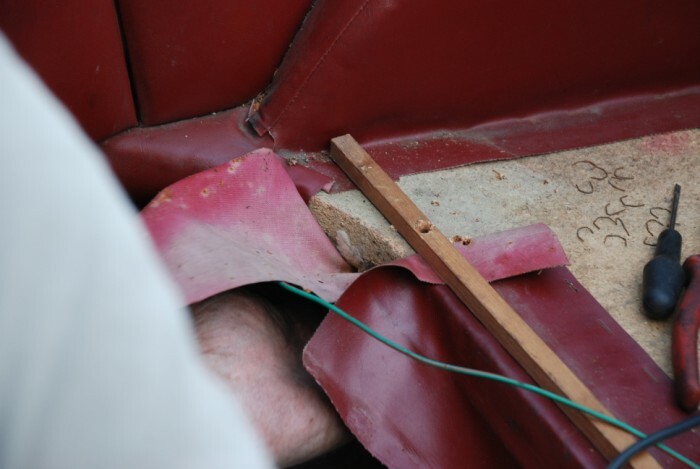 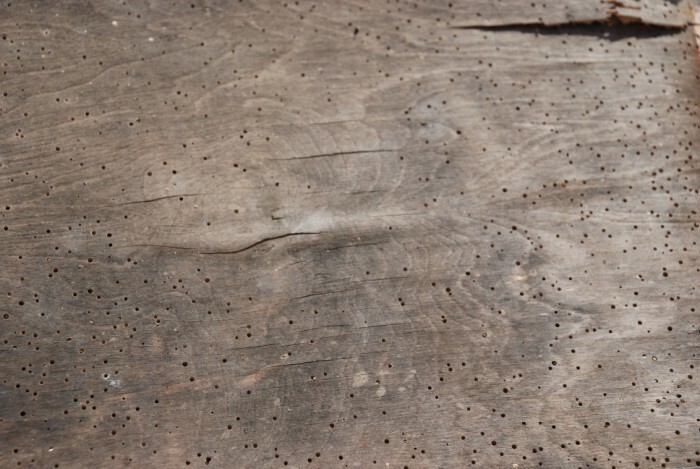 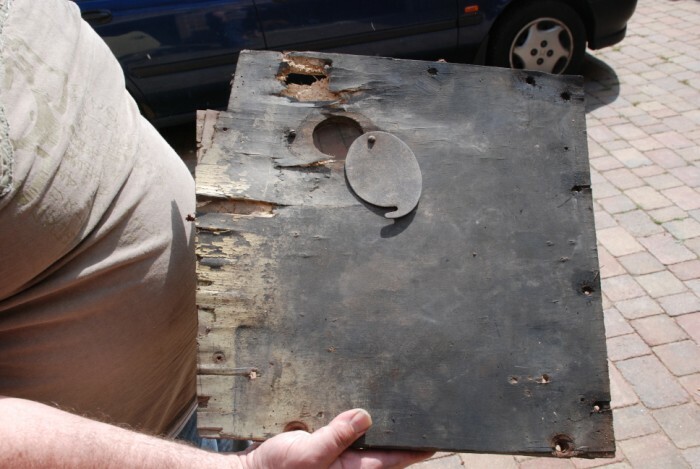 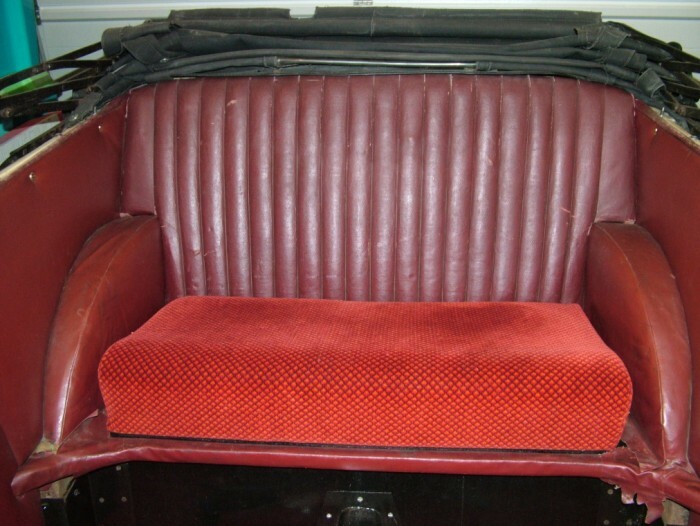 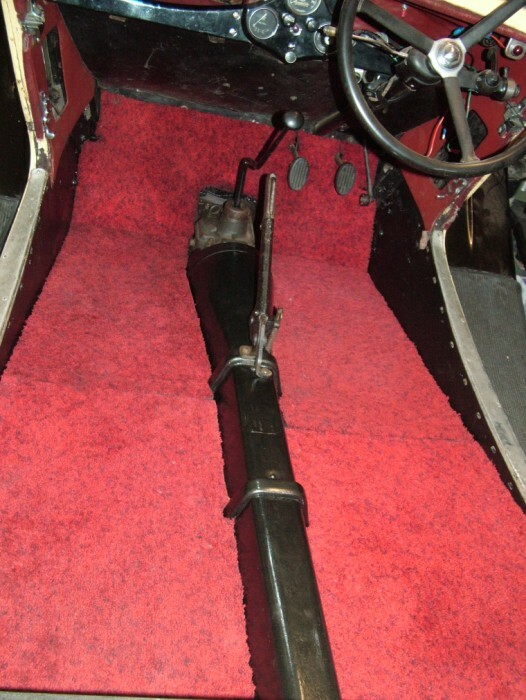 The piece under the rear seat was full of Woodworm. 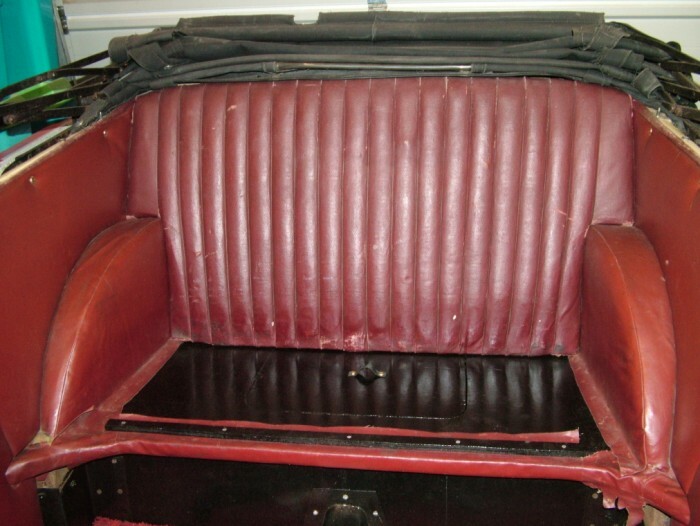 A closer shot of the piece under the rear seat!!! 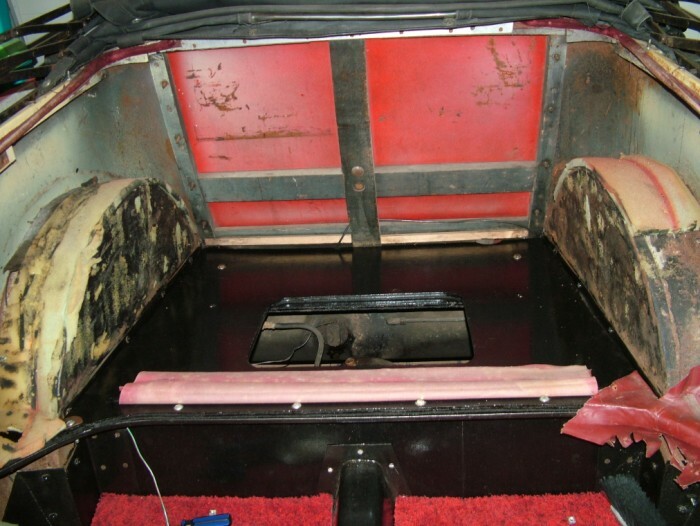 Now for the rear seat!!! 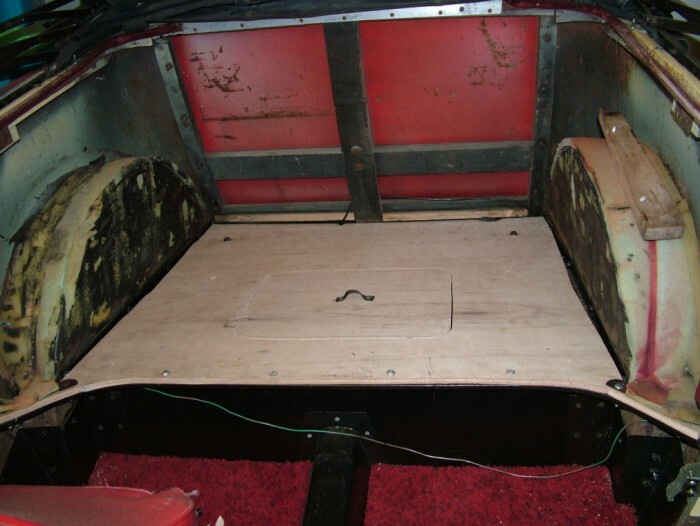 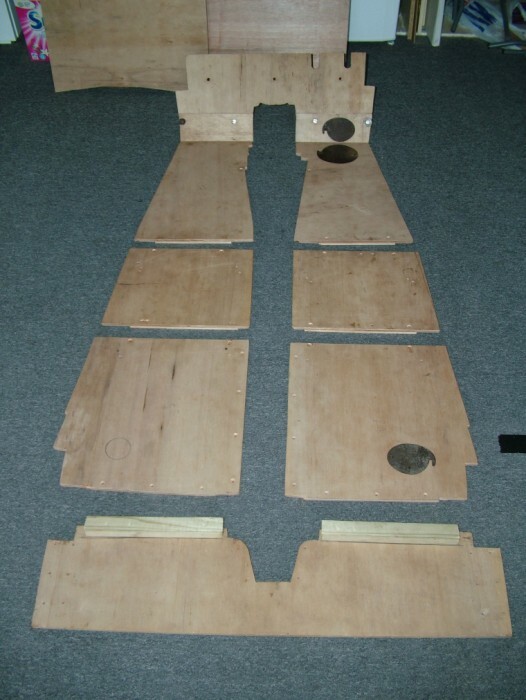 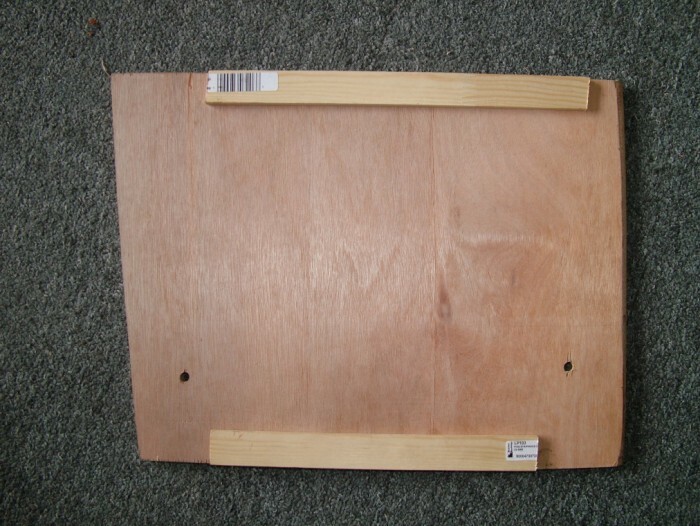 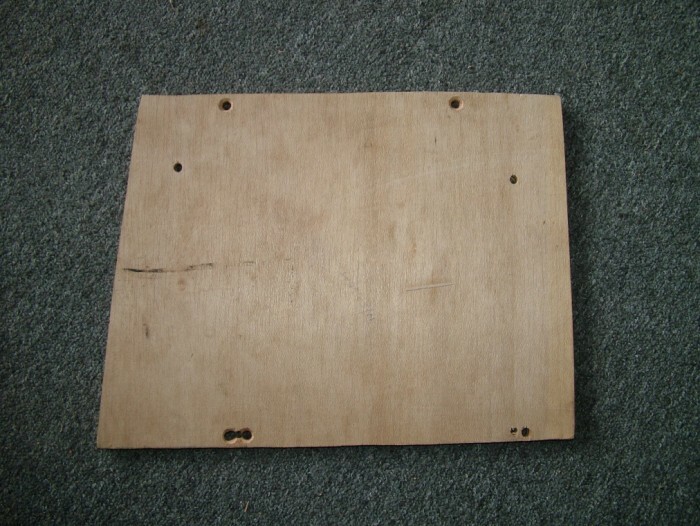 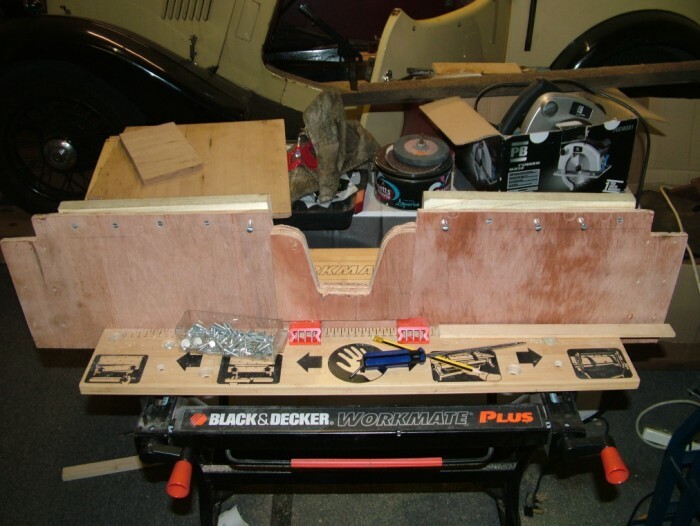 WBP Plywood bought for the floorboards and the rear seat. 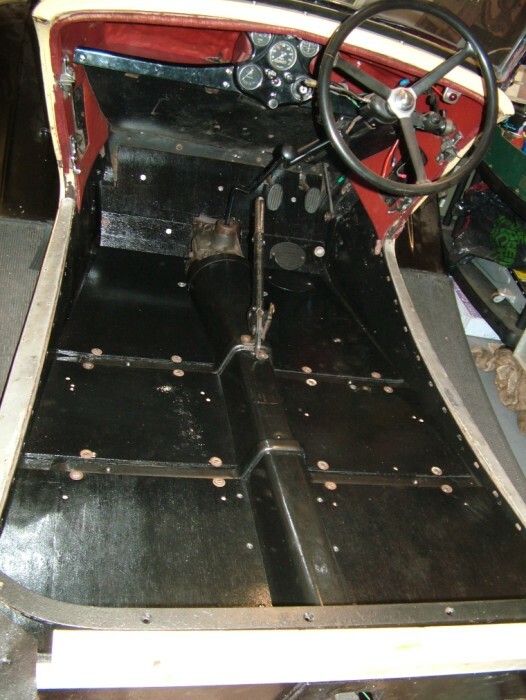 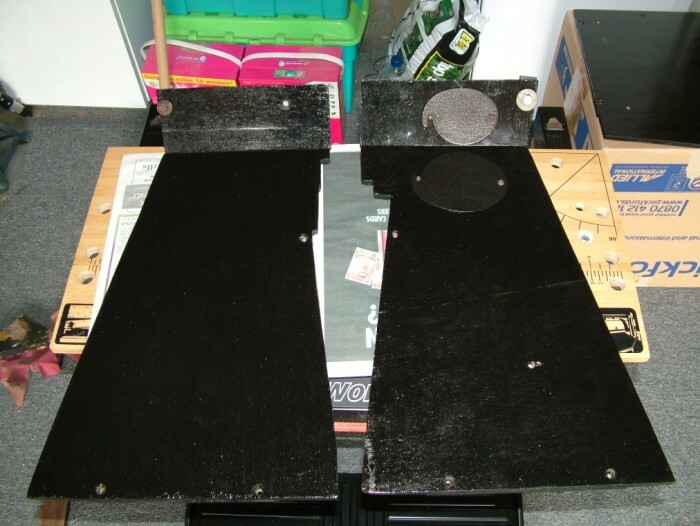 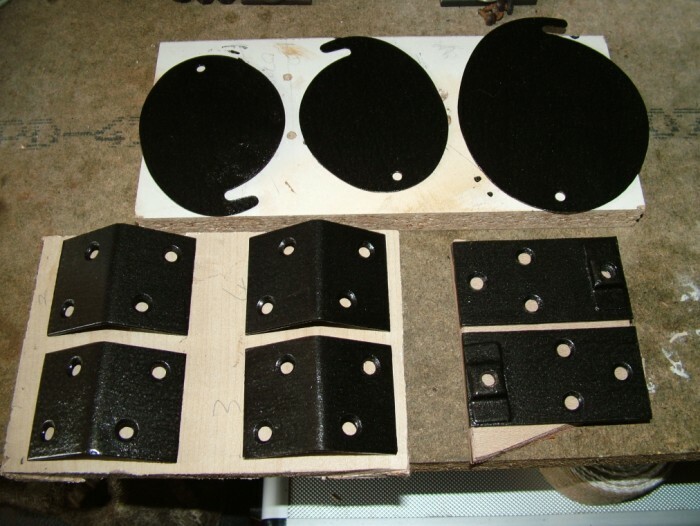 Over the next few days the parts were cut out, drilled and countersunk where necessary and individually test fitted to the car. 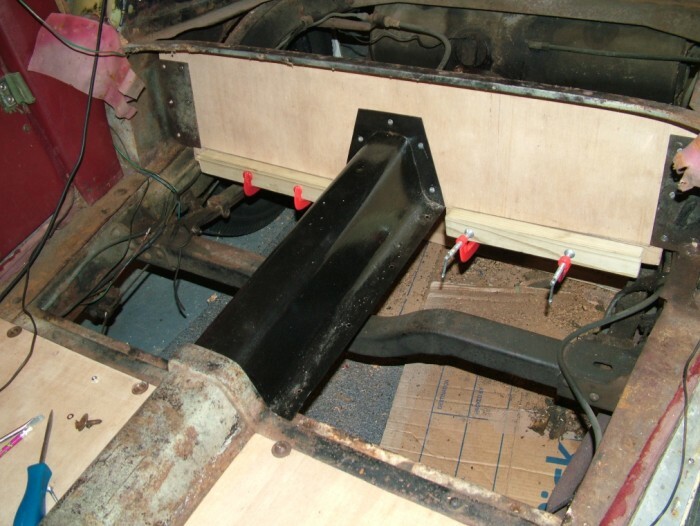 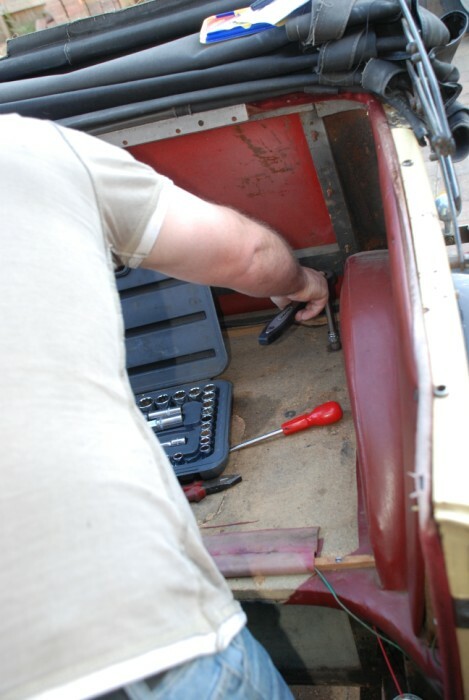 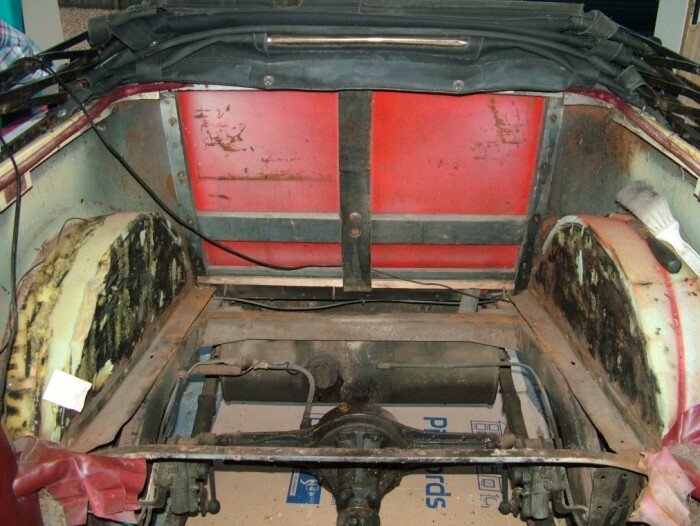 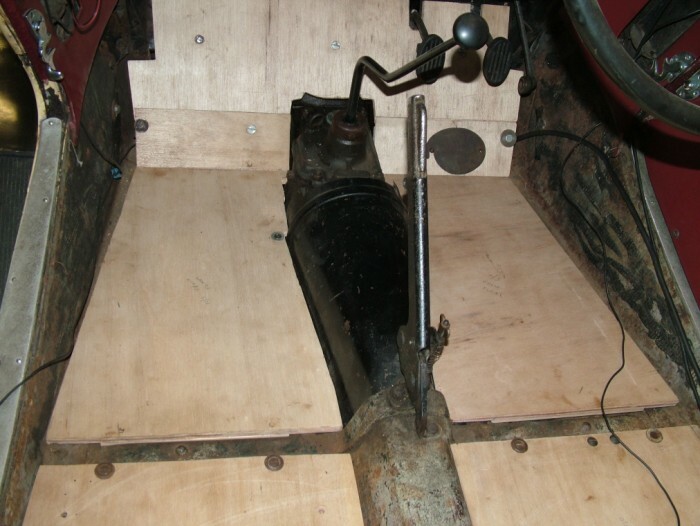 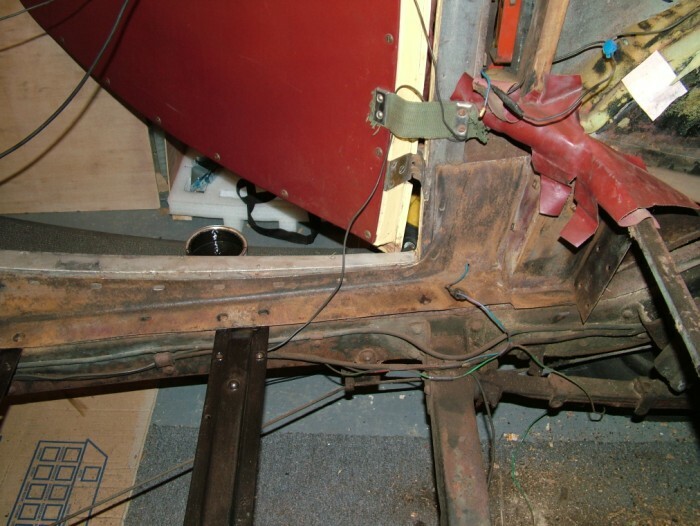 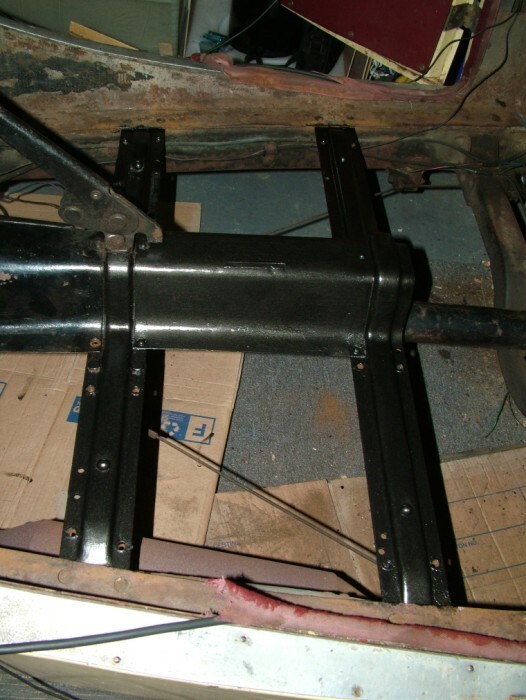 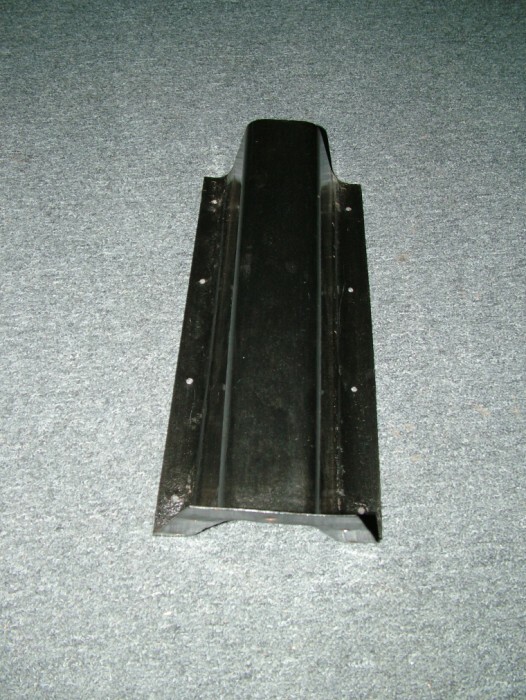 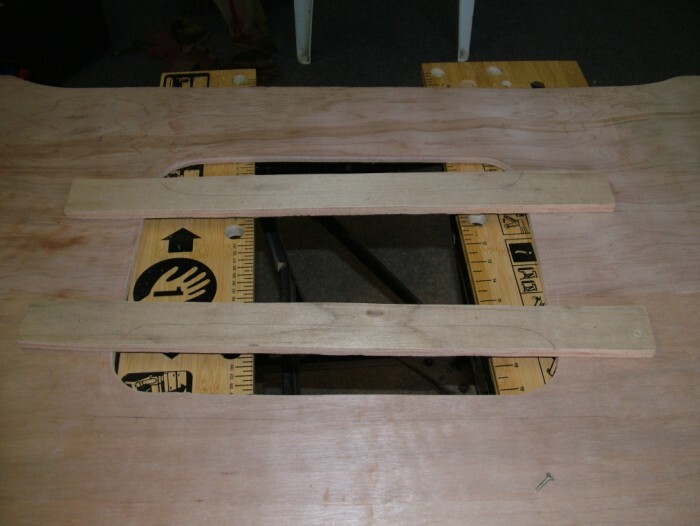 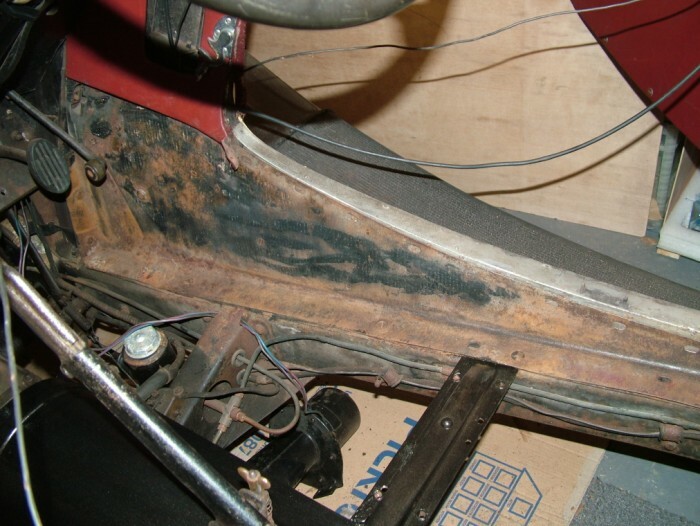 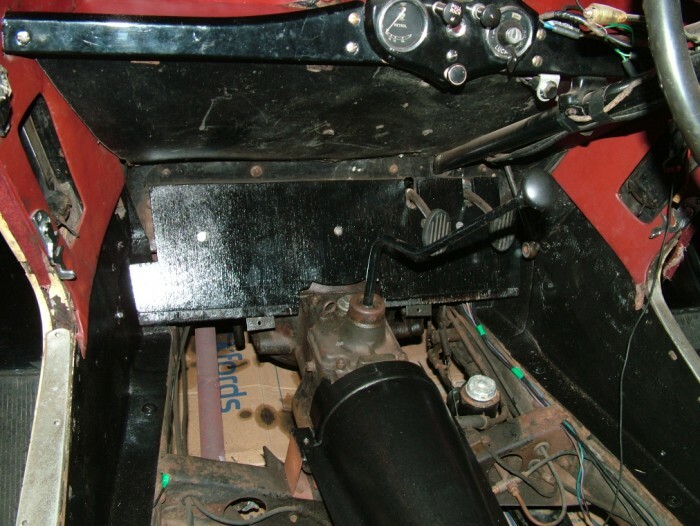 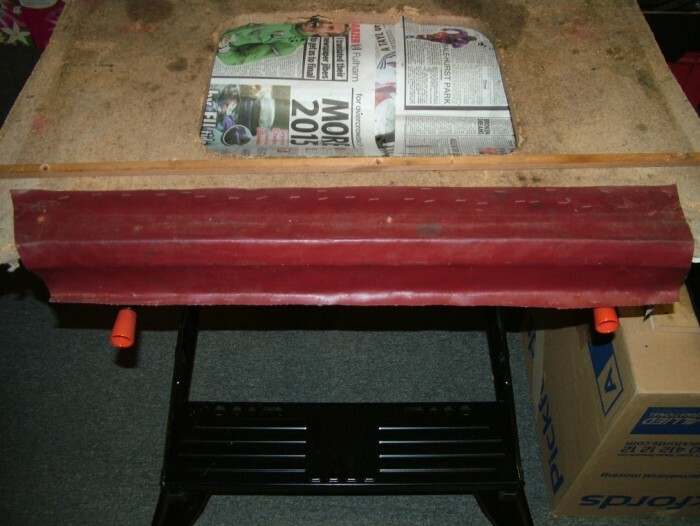 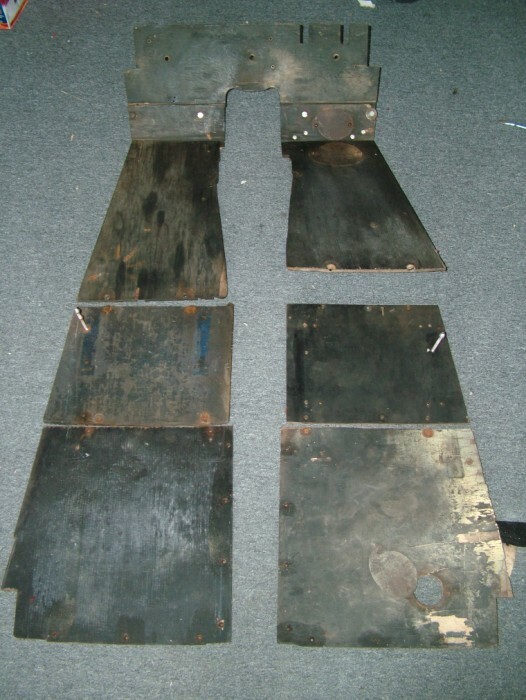 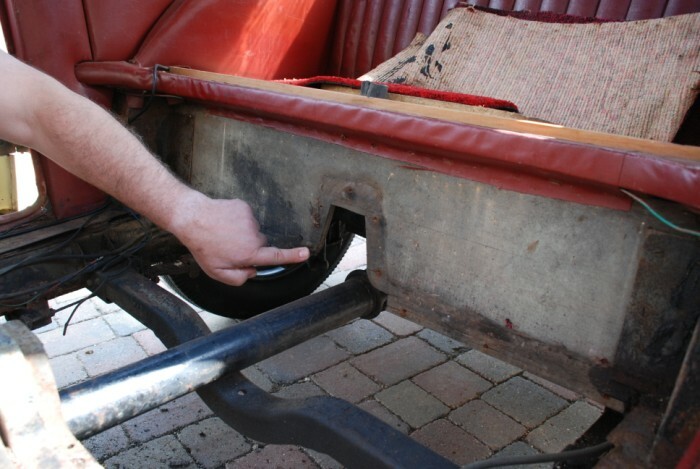 Rear floorboard supports held in place after positioning. 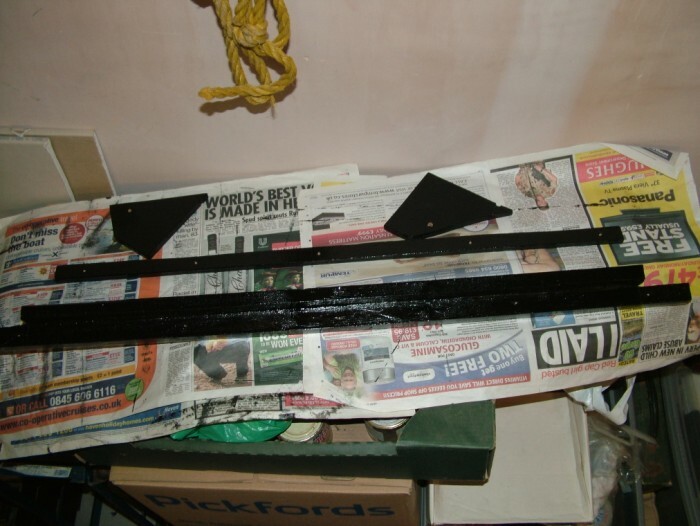 The rear tunnel had its first coat of paint applied, to see how it looked. 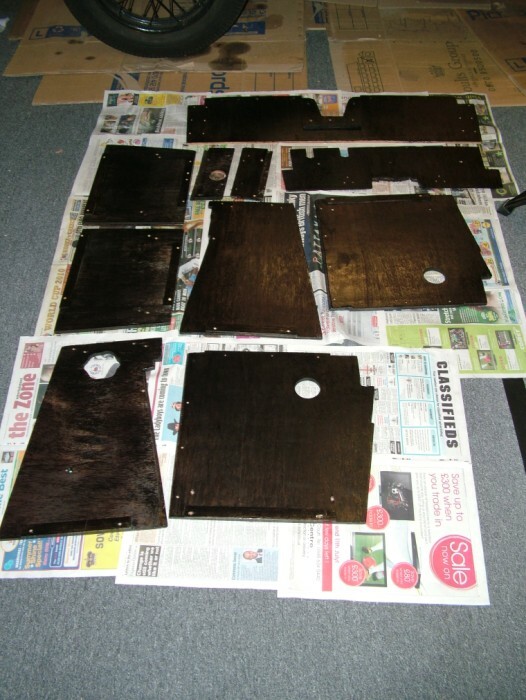 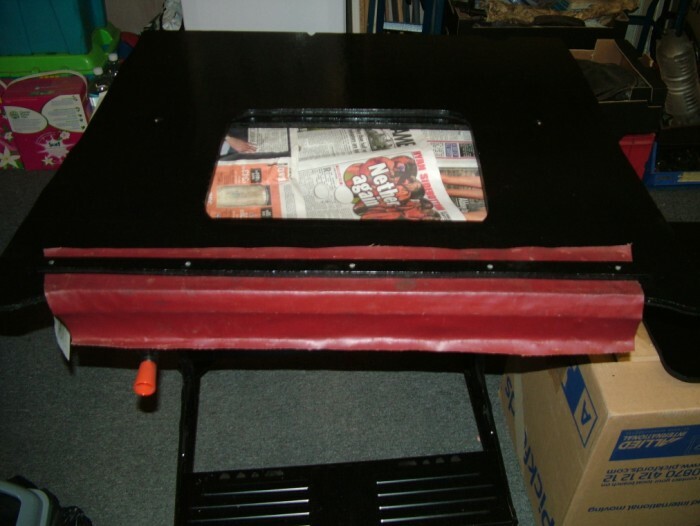 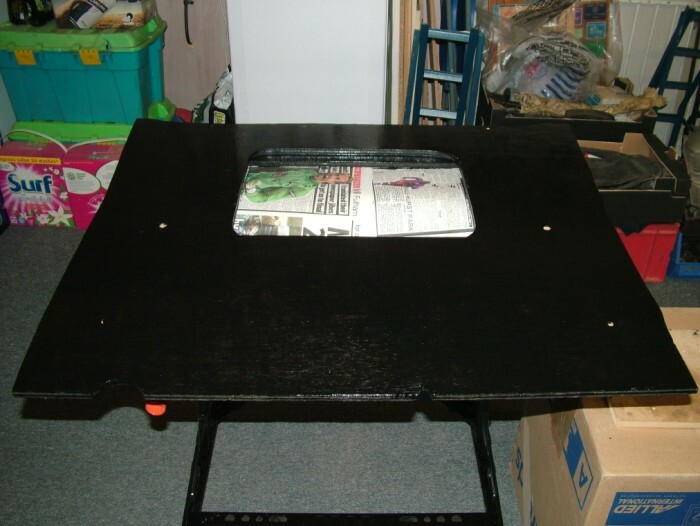 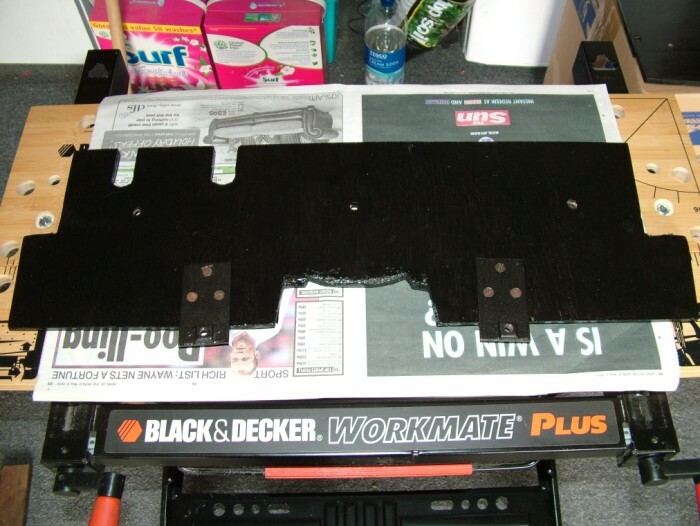 First coat applied to rear seat metalwork. 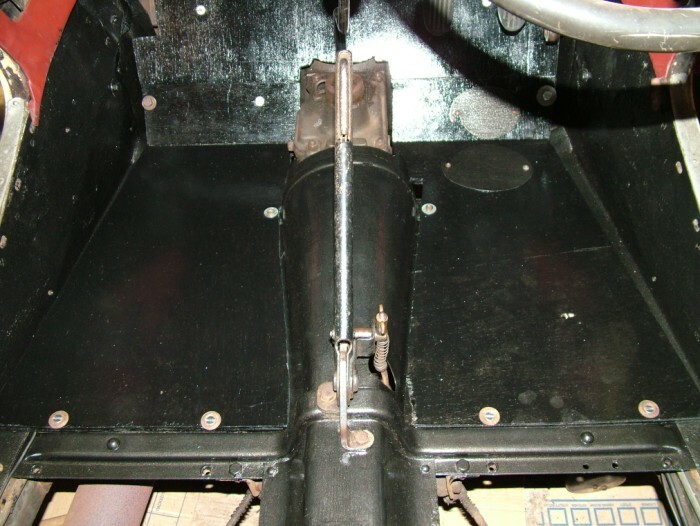 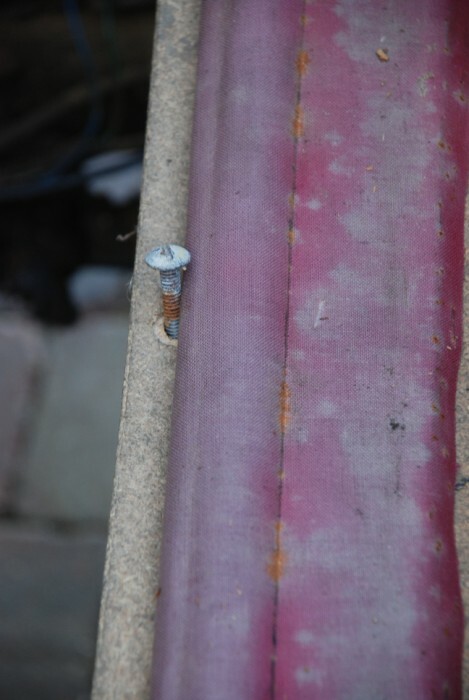 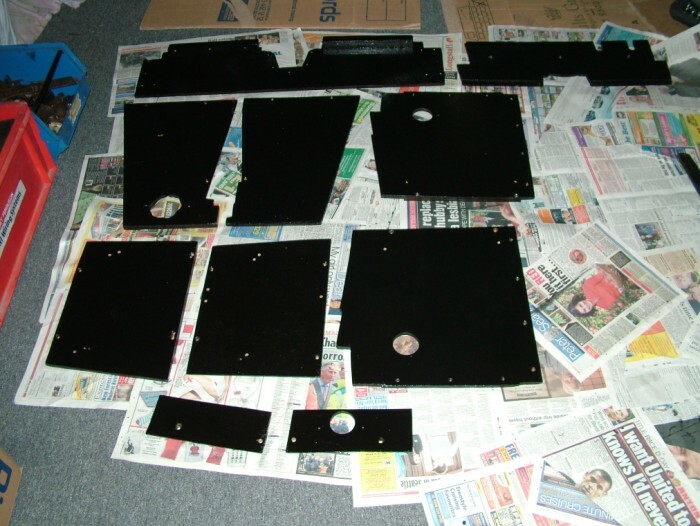 A second coat was applied to the front metalwork at the same time. 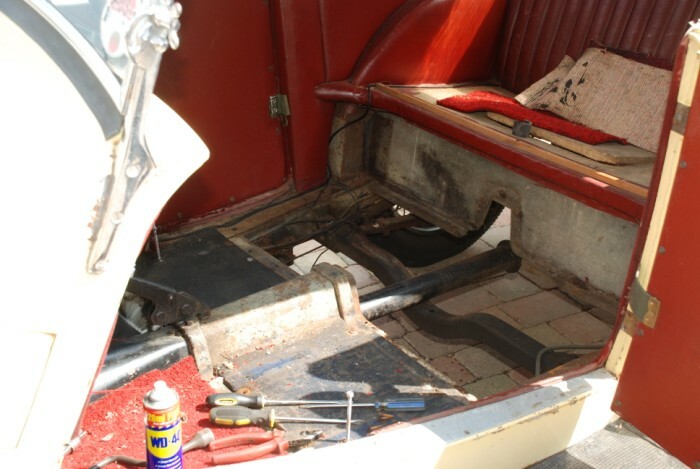 The whole floorboard is in!!! 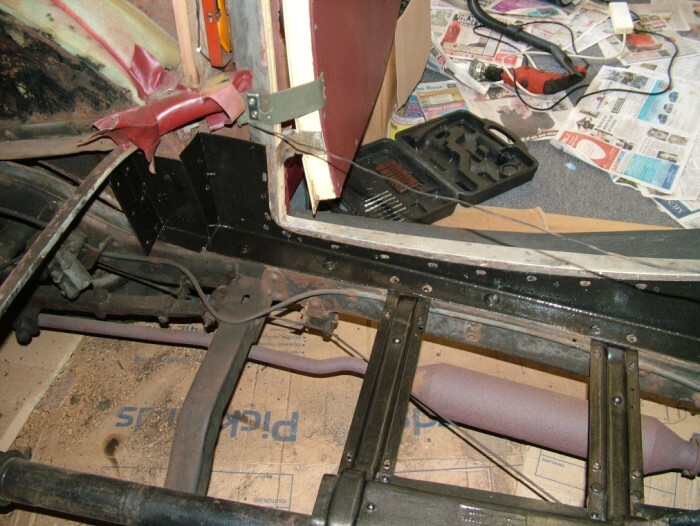 The more observant of you probably noticed that I haven't painted the rear seat front support piece. 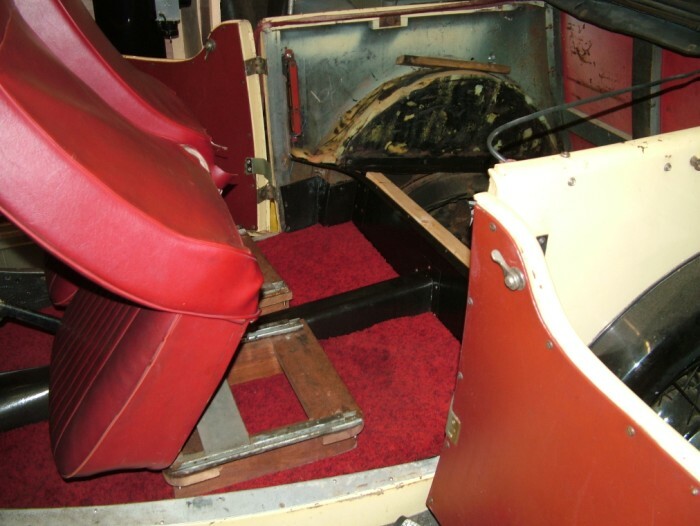 This was because we were running out of time to attend a show on 1st August. 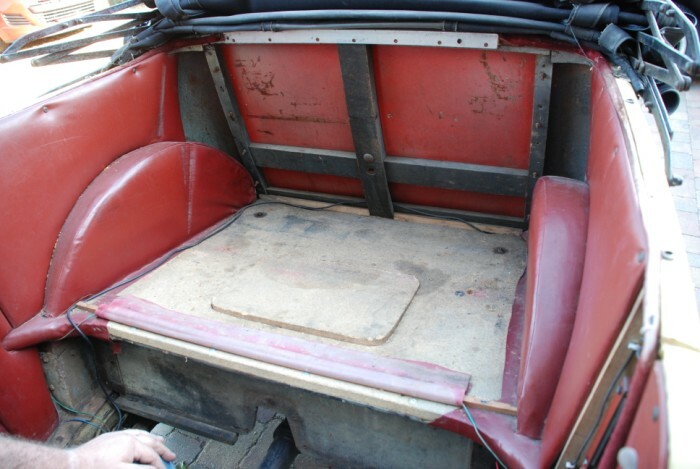 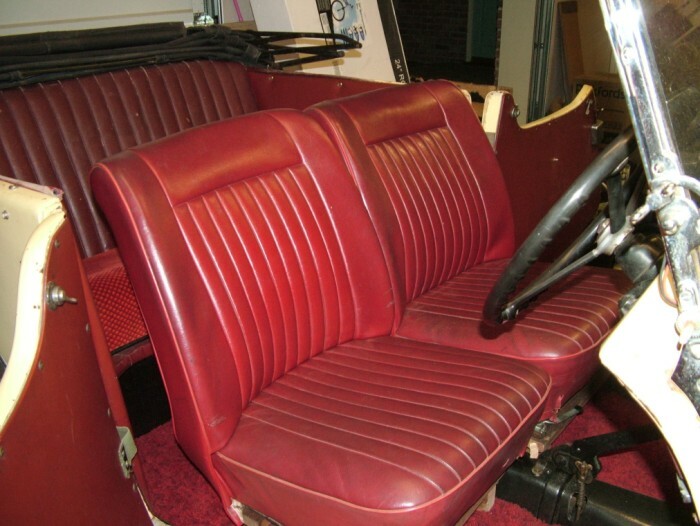 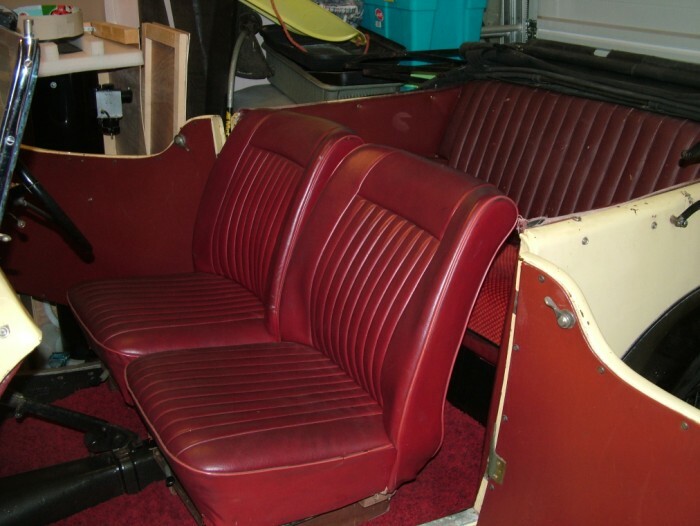 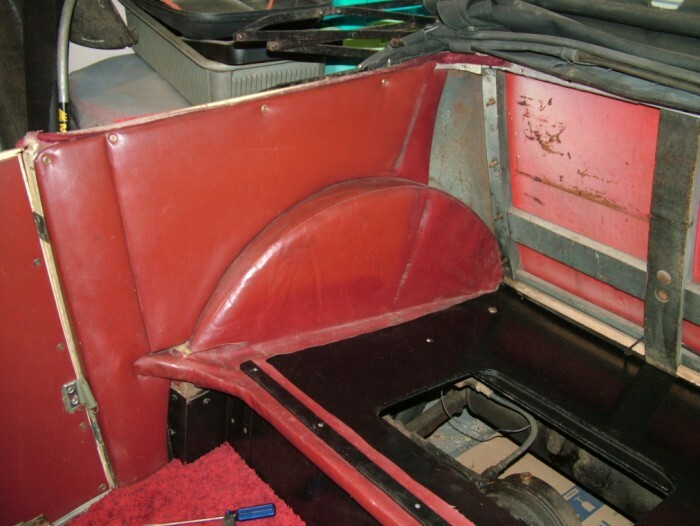 Since the rear seat woodwork is fairly straightforward it was decided that we would remove it again later to paint. 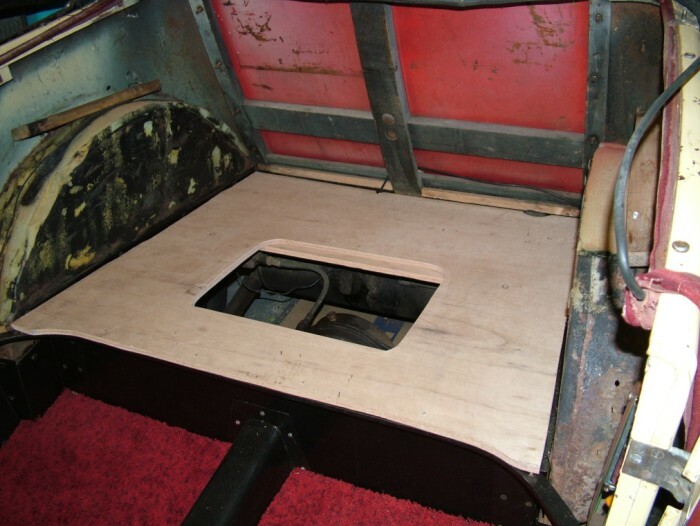 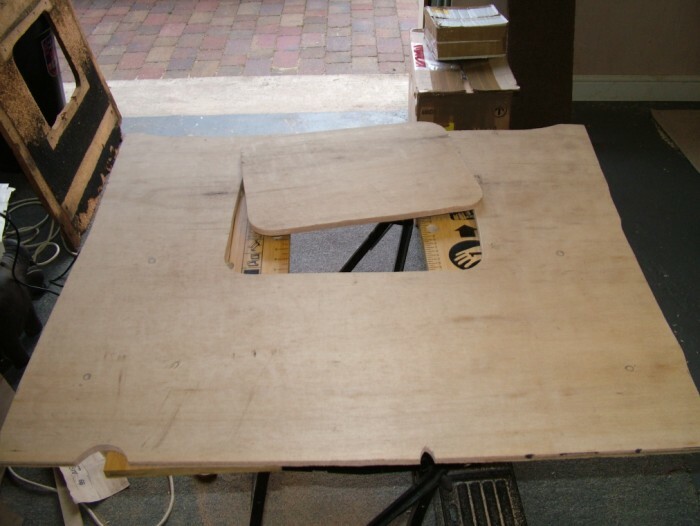 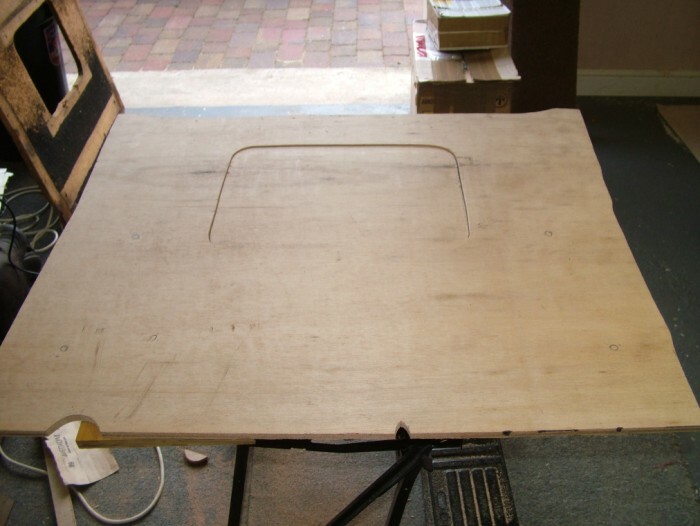 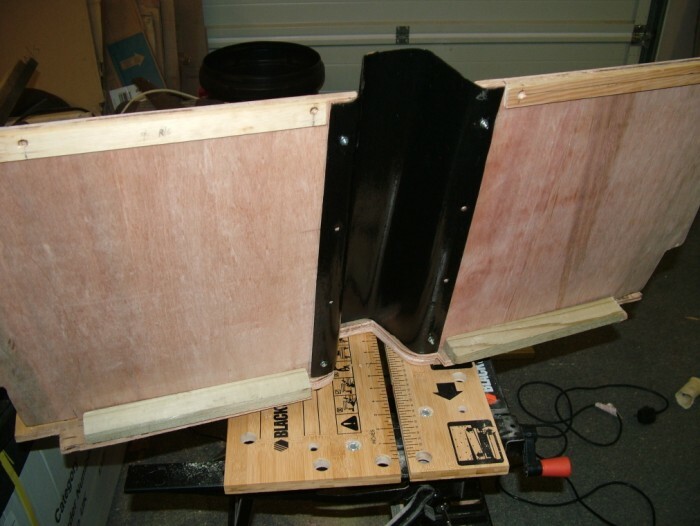 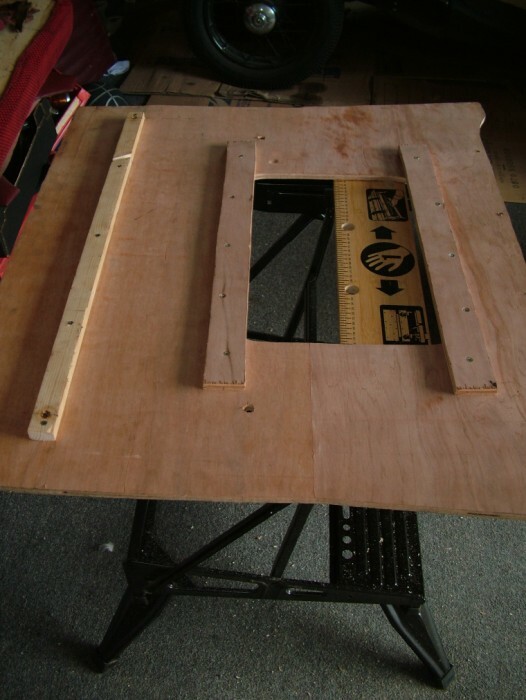 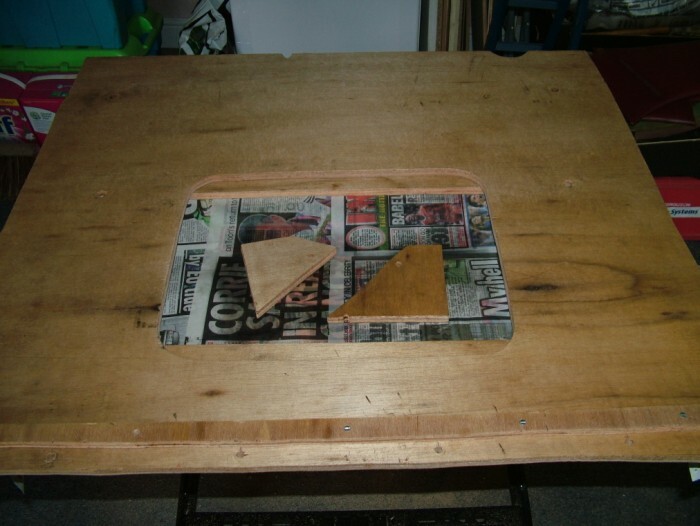 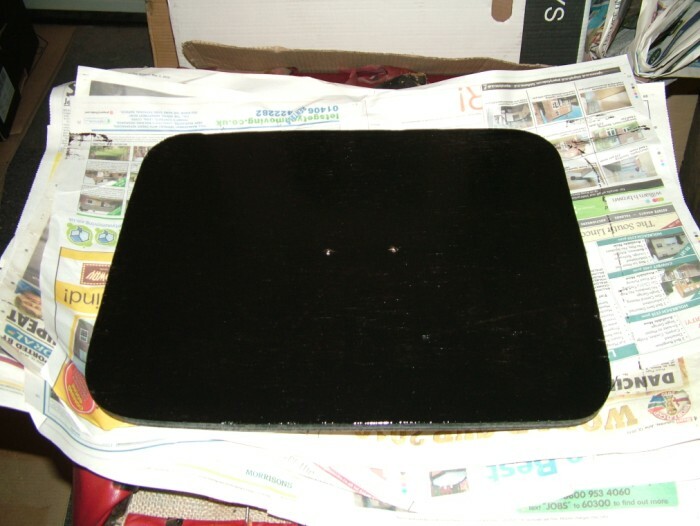 The old rear seat base was used as a template, and the new piece was cut from the remaining WBP Plywood I had used for the floorboards. 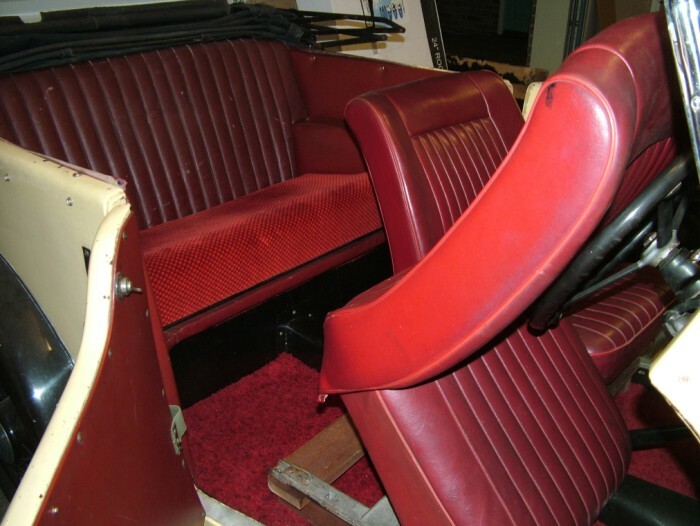 It will do for the show!!! 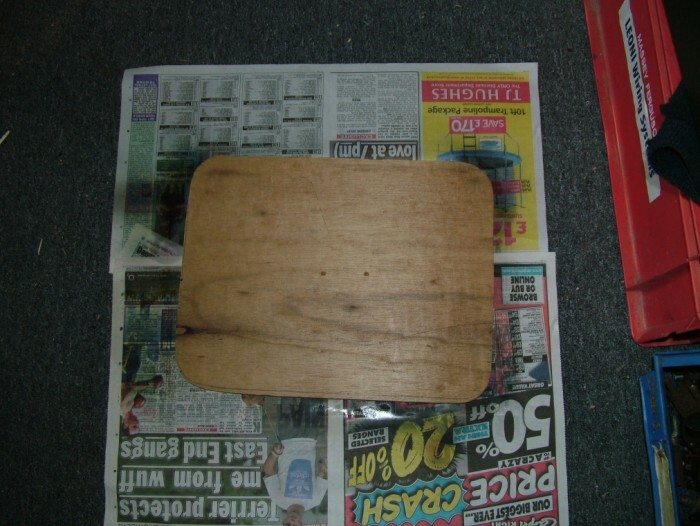 Summer Holidays 7th-14th August 2010 so no work was done for a while. 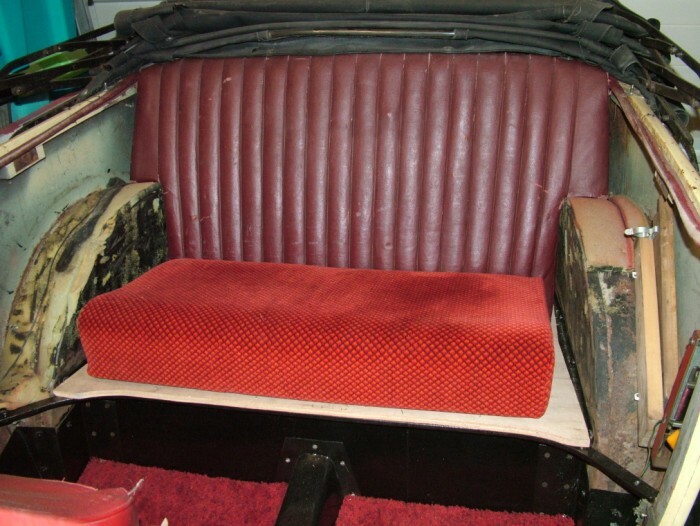 And then the rear seat cushion. 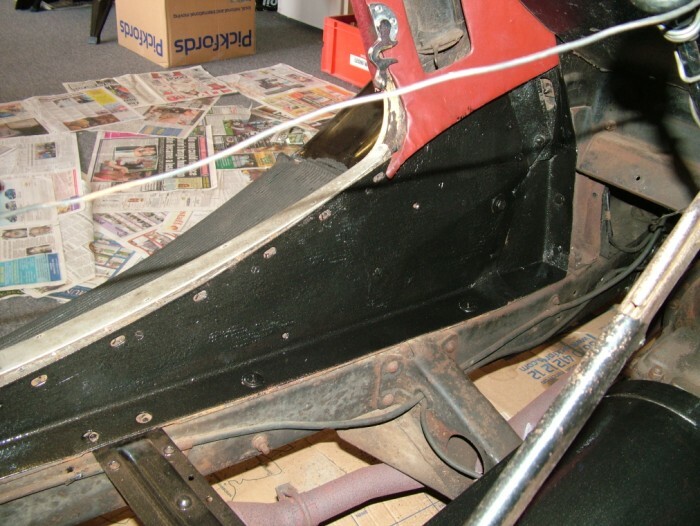 We didn't staple the trim much, as our Winter plan is to strip down to a rolling chassis.